Nurses are not just limited to what nurses should do because they are more than just walking and servicing individuals who are highly capable of delivering the proper and necessary care most patients need. Without nurses, hospitals and other health facilities may not run as smoothly because nurses do most of the hard work to keep these facilities running and treating people together with specialized physicians. We understand the great importance of nurses and that is why our Nursing School in Illinois is accessible for any interested individual aspiring to become a Certified Nursing Assistant (CNA) or a Licensed Practical Nurse (LPN). Nurses are unsung heroes and they do amazing things to help us get better. Receive formal and proper training and you will understand how to operate medical equipment. Yes, and yet nurses seem to do this with so much ease. When you come to think of it, they can even handle a whole ward or unit (depending on staffing necessities) and still know how to read health charts of different patients that require various medical devices to assist their health and recovery. Nurses can also specialize in care but in a way, unlike doctors, they can handle different hospital units or floors. Doctors who specialize in a certain field are limited to handling cases that are related to their field of expertise and make them better at what they do. Nurses can assist physicians with what they need and can cross different units to assist doctors with their needed procedures. Since nurses are first in the line of care, they can easily come to the aid of a patient and make a doctor’s job much easier and faster by monitoring patient conditions and giving initial assessments for the doctor to evaluate. Nurses also hold your hand and make you feel comfortable before you go into surgery. They also prop up your pillow so you can sleep better and have a more restful time in recovery. Our Healthcare Training in Dolton, Illinois welcomes anyone who is ready to be a health care provider. 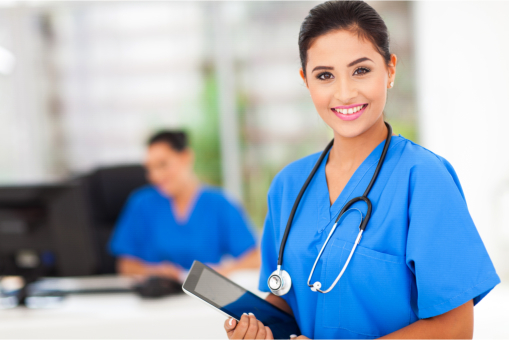 Get in touch with Adonis College of Nursing (USA) to know how you can excel in becoming a CNA or LPN in your area. This entry was posted in Nursing Assistant and tagged health care provider, Healthcare Training, medical equipment, Nursing School. Bookmark the permalink. I wish to show my admiration for your kind-heartedness in support of men and women that really want help with this question. Your personal commitment to getting the message up and down had become rather important and has regularly helped others much like me to arrive at their aims. Your amazing insightful recommendations entails a whole lot a person like me and still more to my colleagues. Regards; from everyone of us. I am only commenting to let you know of the fabulous experience my friend’s daughter obtained viewing your web page. She came to find a good number of details, most notably what it’s like to have an amazing coaching heart to get the mediocre ones without hassle completely grasp a variety of tricky issues. You truly surpassed people’s desires. Thank you for imparting such helpful, trustworthy, informative and even unique guidance on that topic to Emily.